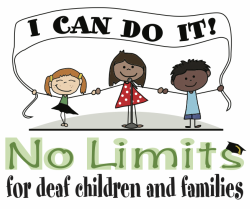 No Limits teaches underserved deaf children and their families the skills to succeed in school and in life through its after-school educational centers and distinguished theater arts program, promoting advocacy and awareness worldwide. We believe in building the self-esteem and communication skills of children who are deaf or hard of hearing by providing the highest quality of services so they can reach their potential regardless of economic status. We strongly believe that parents must be actively involved and educated in this process, as they are the key factor in the success of their children. All children should be given the tools to believe in themselves. All children have the potential to realize their dreams. All children with a hearing loss should have a variety of communication options. All children with a hearing loss deserve to receive a quality education equivalent to their hearing peers. All children with a hearing loss have the ability to become literate and educated and contribute to the community. No Limits is a nonprofit 501(c)3 organization.